After 35 years in the trenches, José Seijas is hanging up his hat. For over 30 years Seijas has been responsible for some of Altadis USA’s most popular blends, and for much of that time he has been the manager for Tabacalera de Garcia, the world’s largest cigar factory. Most of us started out smoking Altadis cigars, if only because they are ubiquitous: Romeo y Julieta, Montecristo, H. Upmann — the classic Dominicans with the Cuban names. But over the years Seijas went beyond the standard name brands and brought us brands like Mi Dominicana, Onyx Reserve, and the Seijas Signature Collection. Maybe it was meant to cap off his career, or maybe not, but last year Seijas developed a limited release blend which was introduced with no fanfare, no flashy ads in the cigar mags, and no press release that I am aware of. 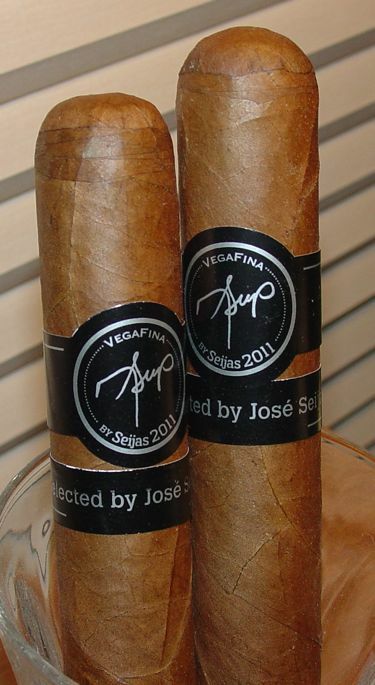 That cigar was the VegaFina José Seijas 2011. I saw a stack of pretty black boxes in the B&M and thought it was strange that VegaFina, a fairly mild econo-smoke, was getting yet another makeover. I grabbed a few and thought nothing of it. A few weeks later I did a little research and discovered that it was a limited edition, and by that time the remaining boxes were sold out. VegaFina is extremely popular in Europe and might be Altadis USA’s best-selling Dominican, at least in countries like Spain and Portugal. It hasn’t done quite as well in the United States, but that hasn’t been for lack of trying. In the late 90’s it was a Honduran cigar with an Indonesian binder, then after a hiatus in production it was re-introduced as a milder cigar with an Ecuadorian Connecticut wrapper. But the 2011 blend is different from both of those. It utilizes a Mexican wrapper from San Andres, but it isn’t maduro, which is what I automatically think of when I hear “San Andres.” It’s criollo. The binder and filler leaf is Dominican, and only one size was made: a 6 x 56 toro. It was originally released in black laquer boxes of ten, and the first release was limited to 2,500 boxes. The wrapper on the Vegafina 2011 is darker than the Ecuadorian Connecticut on the standard line, and even with a few unobtrusive veins it is still attractive. The roll is firm and consistent — the large ring gauge is hefty, but the stick feels comfortable in the hand. The head is wound nicely, but a ragged edge to the leaf obscures the quality of the cap. It clips cleanly and the draw is effortless. The wrapper is fairly thin and I somehow managed to chip the cigar as I transported it from the humidor to my smoking lounge. (Some people say my “lounge” looks an awful lot like a deck chair perched on a sand lot. True enough. What used to be a volleyball court now looks a lot like the world’s largest ashtray.) In any case, the chips and nicks at the foot of the cigar were soon put out of mind as the cigar was lit and turned to a smooth light gray ash. The Vegafina 2011 starts out smooth and creamy with just a pinch of black pepper at the back of the palate. The smoke texture is pleasantly full and the aroma is complex — it’s not as floral as Connecticut shade, but it’s still mildly sweet with woody scents. It’s hard to believe a Mexican wrapper leaf can be this subtle, but it is. A mildly dry aftertaste develops in the middle section, but the smoke is still rich and aromatic. The base flavor is both earthy and nutty — something like walnuts maybe — and the cedary aromatics add a nice balancing touch. The dry flavor continues into the last section, but unfortunately it also tends to become a tad bitter. I was suddenly reminded of the Mexican element of this cigar, though I don’t think that the wrapper is to blame. In any case, I couldn’t smoke this one much past the secondary band. I really enjoyed the first half of this cigar — the flavors are rich and complex without having to flex much muscle. But the dryness in the second half and final bitter note are an unfortunate conclusion to an otherwise very interesting cigar. I am keeping in mind that some people like that bitter note, and since it isn’t overwhelming I think there are many people who won’t be bothered by the last inch of this stick. But at around $6.00 per cigar, there are also many fine alternatives.